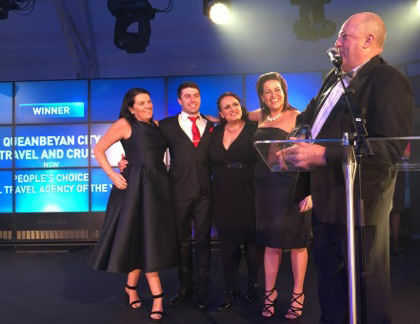 Queanbeyan City Travel & Cruise, is a multi-award winning agency and is independently owned and operated by Jim and Jenny Cooper. We have recently won the International Traveller Magazines inaugural ‘Readers’ Choice’Award 2016 and we are a member of Travellers Choice, which has more than 150 independent members across Australia and won The National Travel Industry Awards 'Best Travel Agent Group 2015' award. The company has been around for more than 30 years and an important element of its success is its unwavering focus on delivering the highest quality customer services. As an independent member we have the freedom to tailor our services to meet the needs of our clients, and at the same time enjoy the support and buying power of a national travel group, which enables us to offer you the very best deals possible. We are also an ATAS accredited Travel Agency. ATAS is administered by the Australian Federation of Travel Agents (AFTA) and vets travel agents against strict criteria to ensure they meet certain standards, are reliable, well trained and professional businesses. Before becoming accredited, ATAS agents need to meet high standards of business discipline, training, compliance with Australian Consumer Law and compliance with a strict code of conduct – ensuring you peace of mind when booking travel. Queanbeyan City travel & Cruise is also a member of Cruise Lines International Association (CLIA). CLIA is an industry body which aims to increase travel agents' understanding of the wide range of cruise products available for clients, as well as the enormous variety of cruise itineraries worldwide. This is teamed with our knowledge of the travel industry and world, along with firsthand knowledge from our own travels and client feedback. We are constantly expanding our knowledge and experience to ensure we work with you to design an itinerary that gives you an unforgettable holiday!